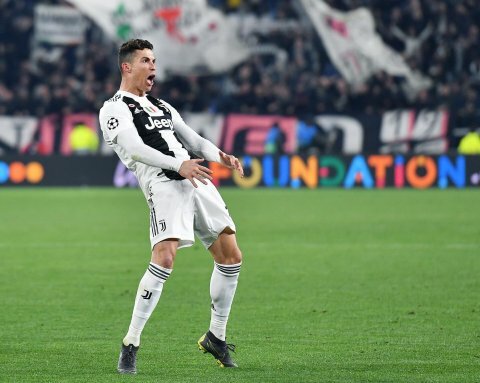 Atletico Madrid boss, Diego Simeone has spoken about Juventus star, Cristiano Ronaldo’s celebration after the Portuguese netted a hat-trick in their Champions League round of 16 second leg in Turin on Tuesday. The Argentine gaffer also spoke on the performance of the 34-year-old former Real Madrid star in the game. Ronaldo goaded Atletico Madrid’s supporters by using the Simeone’s ‘cojones’ celebration following Juventus’ 3-0 victory. Max Allegri’s men were chasing a 2-0 defeat from the first leg in Spain but Ronaldo scored 3 times to secure their place in the Champions League quarter-finals. Atletic boss, Simone was fined €20,000 (£17,000) after he turned to Atletico’s fans and grabbed his crotch during his celebrations in the first leg in Spain. However, after scoring his hat-trick in Turin on Tuesday, Ronaldo used the same celebration. On why they were defeated 3-0 by Juve, he said, “They were better than us and we have to compliment them. “We tried to play our game. ‘In the first half we played well, but in the second we didn’t manage to make anything to get us through. “Honestly, I’m calm and the players did well this week.